This story originally published in the May 21, 2014 edition of The Banner Press, please pick up your copy to read full story! A crisp American Flag flying high in memorial to those who have fought for our freedom. For years I have been driving to the Bollinger County Memorial Park just outside of Marble Hill, Missouri to get a glimpse of the beautiful flags surrounding the park. Last year as I drove out to photograph the flags, I noticed several folks doing the same and I realized these flags are more than just beautiful; there is a story behind them. I had the opportunity to talk to Kenneth Liley, part of the Liley Family Enterprises and Bollinger County Memorial Park, and asked him the meaning, motivation, and plans for the flags that fly so beautifully around the park. Mr Liley explained to me that it seemed for a period of time during the 1980’s there didn’t seem to be much recognition for our Veterans and even the American flag. He also went on to explain that in the past it seemed next to impossible to pull together a military service for the deceased and when they did have a military service people did not seem to know what to expect. The Liley family knew that so many people have given their lives for our flag and our freedom that they wanted to see this changed. 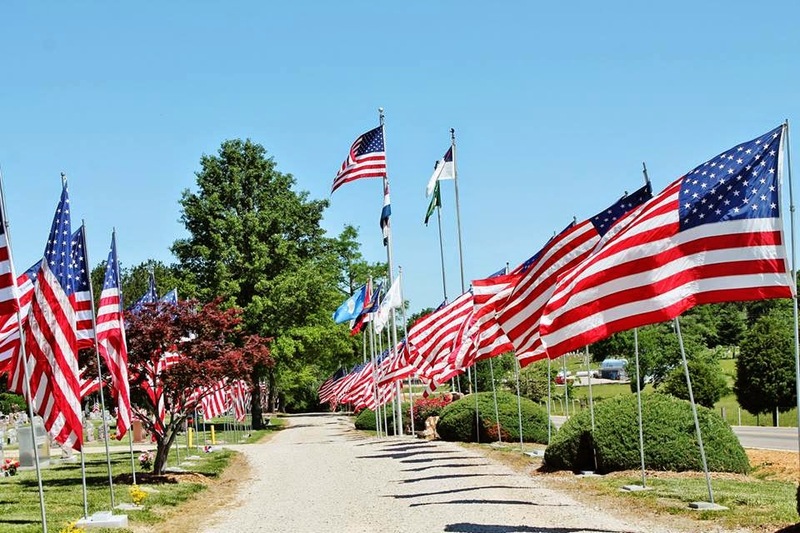 In 1992, the Liley Family established the Flag Memorial in Bollinger County Memorial Park and since the memorial has grown and continues to grow. Currently there is approximately five hundred flags that fly high around the park. The flags are put up three holidays a year; Memorial Day, Independence Day, and Veterans Day. The Liley Family employees put the flags up typically at 2 pm the day before the holiday, unless the holiday falls on a weekend then they are put up the Friday before and remain up until the next business day after the holiday. It is unknown how many people drive to Bollinger County Memorial Park annually to see the flags, around the holidays; you can see the locals fill the social networks with photos of the beautiful tribute, to me that says the Liley Family has succeeded their goal. If you have not seen the memorial I encourage you to go and take your family, rather you drive by or attend their Memorial Day Service. 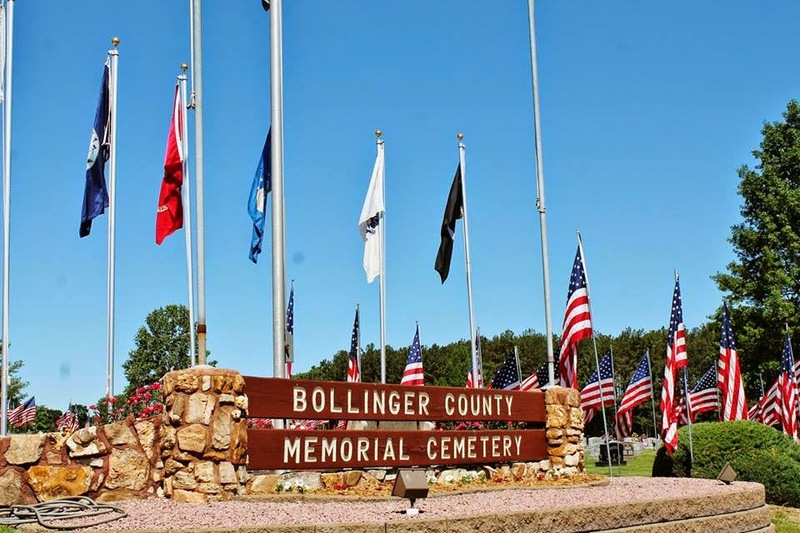 The Bollinger County Memorial Park memorial service takes place every year on the Sunday before the National Memorial Day starting at 2:00pm in the Chapel Pavillion on the cemetery grounds. This annual service has been a continued tradition since 1949 and is beautiful tribute to those that have fought for our freedoms. The ceremony includes singing, speakings, and a complete Veterans funeral service performed by our local VFW Post 5900. The VFW’s part of the ceremony consist of the firing squad, flag folding, taps, and presentation. Their part of the ceremony is truly beautiful.